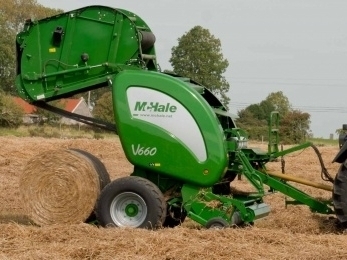 As with all McHale machines, the V6 variable chamber round baler range(belt baler range) has been designed with the demands of today's farmer and contractor in mind. This common sense approach to design, ensures that the McHale V660 variable chamber round balers' operation is kept simple and user friendly. Features like, the three belt variable bale chamber with double drive and the drop floor unblocking system, when combined with high specification components, ensures long life, reliability and a variable chamber round baler that is rugged enough to handle the toughest of crops and ground conditions.